Like putting a personal touch on your PCs? Customization options abound in Windows 8 and Windows 8.1, but these features can often be hard to find, an issue exacerbated by Microsoft's dual (or should I say dueling?) interfaces. Strategically burying some Control Panel options under the Charm bar doesn't help matters either. Enter GodMode—a handy, hidden folder well-known to IT pros who want to quickly get at a wide range of customization options on the desktop, but one few everyday users know about. GodMode basically provides easy, direct access to all of Windows' various far-flung features and customization options from a single interface, sorting them into handy categories like Display and Administrative Tools. 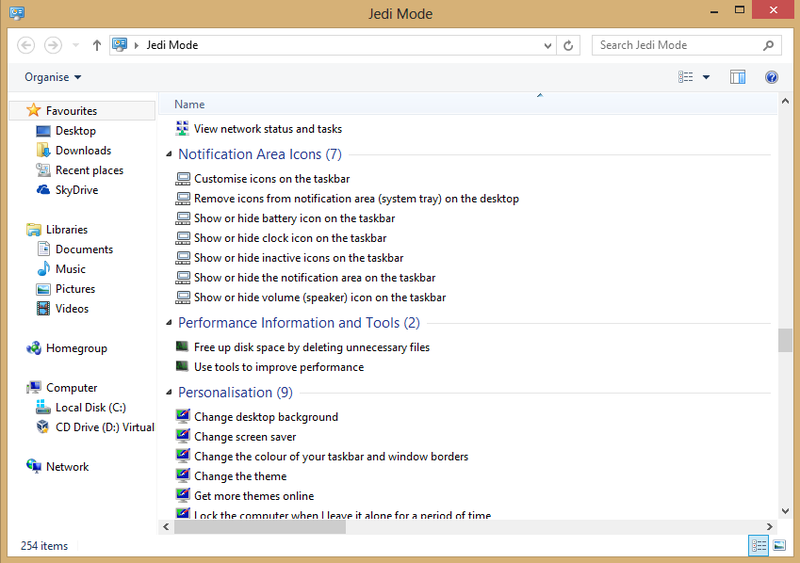 Whether you want to adjust your monitor's resolution, tweak your folder options, or customize your taskbar's notification area, it's all a single click away in GodMode. The first step in the path to GodMode involves creating a new folder, so head to your desktop and right-click, then select New>Folder. The "New Folder" text should be highlighted underneath the folder, allowing you to change its name. If not, right-click on the folder and choose Rename. Your folder should convert into an icon that looks suspiciously like the Control Panel. Click on it and let's take a brief tour. GodMode opens like any other folder and organizes all your PC settings similarly to the "small icons" option in the Control Panel. The difference with GodMode is there are no guessing games, and you can access all the customization options for your PC from this single location, rather than diving deep into far-flung submenus. Want to change your screen saver? Just open the GodMode folder, scroll down to the personalization section, and click on the Change screen saver option. 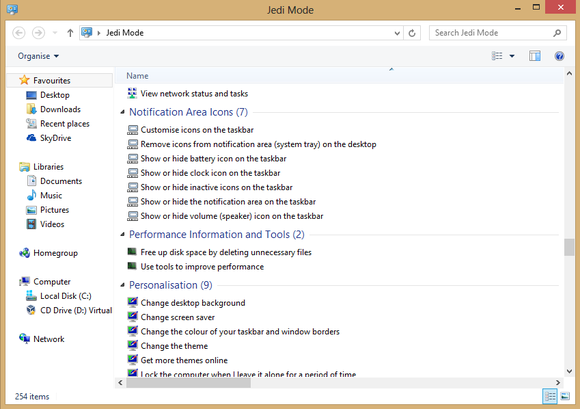 GodMode will work on any PC running Windows 7, 8, or 8.1. It also works on Vista, but it may be less stable than on later versions of the OS. You can also put the GodMode folder anywhere you like. 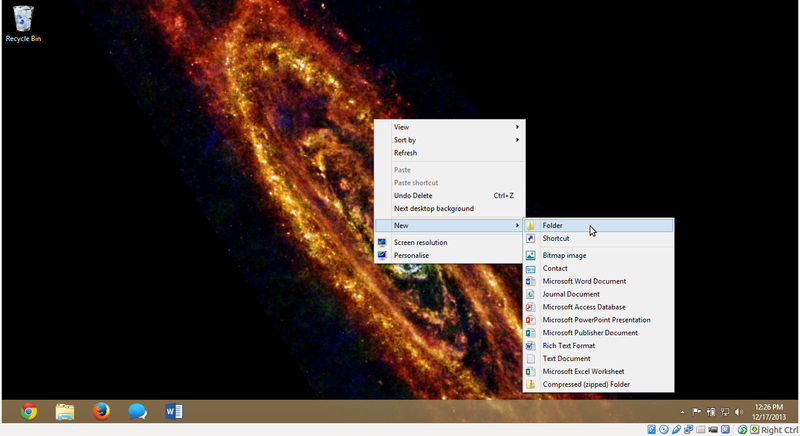 You could pin it to the File Explorer in the taskbar, throw it in your Documents folder, or even pin it to Windows 8's modern Start Screen (if you're into that kind of thing). If you don't like the term GodMode, you can rename the folder to anything you like. The only caveat is that you must not remove the period placed just before the brackets, or change the string of letters and numbers inside the curly braces. Those letters and numbers tell Windows what kind of special folder you want to create, so if you tamper with that string, your divine powers will evaporate. But the name you see every day on the desktop is entirely unimportant to Windows. If "GodMode" doesn't ring right with you, might I suggest my personal favorite? 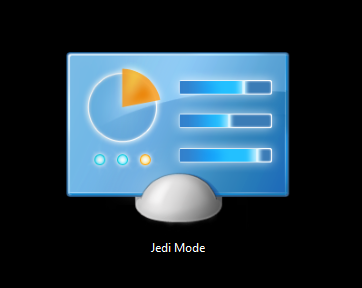 Jedi Mode.